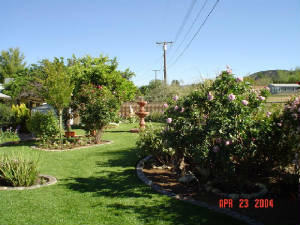 After having gone on several garden tours, it became our goal to complete the yard so that it could be on our local garden tour. After a lot of work, that goal was realized in 2004! 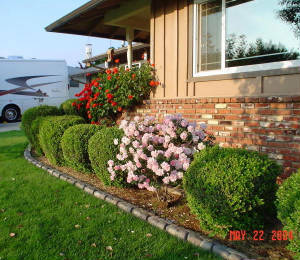 In photo 1 you can see the Bead Fountain in the center of the yard past the rose island. 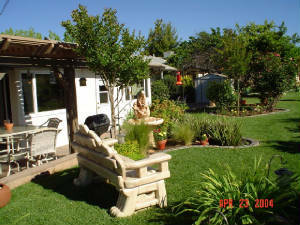 Photo 2 shows the Indian Maiden Fountain and the new cement park bench that was purchased in spring of 2003. Snapdragons and marigolds are in pots near the fountain. In 2003, we added a bird bath with a playful raccoon design. When we later saw the Mischief Fountain (photo 3), we just couldn't resist getting it, too. The pretty pink flowers behind it are from the Cecile Bruner, a beautiful climbing miniature rose that spreads like a vine. 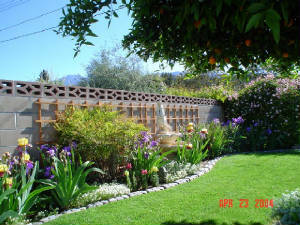 In 2004, Fred installed a trellis on the north wall behind our Well Girl Fountain to accommodate the morning glory that we transplanted from another area (photo 4). A couple of weeks before the garden tour, we planted snapdragons, marigolds, and petunias to the rose island to add some color. 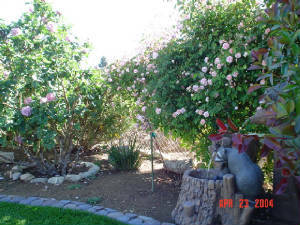 Earlier in spring it had become clear that the mini rose bush in the backyard was getting too crowded where it was and needed to be moved. So, it was transplanted to the front yard where one of our other bushes had died. Amazingly enough, after a short period of looking a little sad, it burst into bloom (photo 6) in the middle of May! 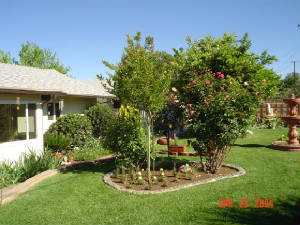 No one is more amazed or happier than I am about the transformation of the yard since I moved here in 1997 Now that the foundation has been set, gardening has become more fun than work! Back to Fred and Jean's Travel Photos site.